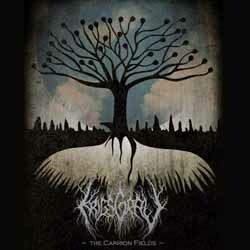 American atmospheric black metallers Krigsgrav from Texas have revealed the first details of their upcoming 3rd full-length album, “The Carrion Fields“, which will be released on 12th of December 2014 through the German label Naturmacht Productions. The theme of the album is the cycle of the seasons in nature and the parallels between this and the life cycle experienced by all living things on this earth. So, each song represents a different season, but also a different stage in the life cycle of man. The band has already unveiled the amazing cover artwork by Steven Ott, as well as the album tracklist. You can also listen to the track “Spire of the Hunt” revealed today by their label.